Every spring there’s a community-wide garage sale in our town and we like to get in on it. 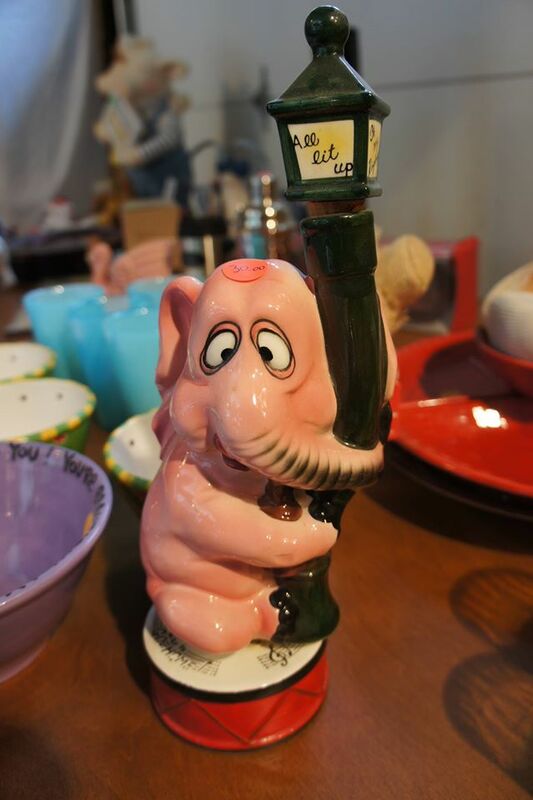 After all, you can make hundreds of dollars in one weekend selling things you want (or need) to get rid of any way, like the pair of duck decoys gathering dust in our garage or the frightful clown figurines I inherited from my aunt (as they say, “one woman’s trash is another woman’s treasure”). But, we learned the hard way you can’t just set out a mishmash of stuff hoping people will come along and buy your second-hand goods. It takes planning, organization and some know-how to make your sale a success. Otherwise, it’s not worth the time and effort. After our first garage sale was a bust (we had no idea what we were doing), we consulted our friend, Larry, who is known around here as the “Garage Sale King.” That’s because he manages to rake in between $2,000 and $3,000 every year peddling everything from bikes and baby clothes to fishing tackle & flower pots. Suffice it to say, Larry knows what people want and what they’re willing to pay for them. • Sort and set aside items you want to sell. Make sure they’re in good condition (they may be used, but no one wants to buy things that are dirty, stained, torn, or broken). Some of Larry’s top sellers: kids’ clothes & toys, kitchenware, furniture, sporting goods, camping gear, tools, lawn/garden supplies, collectibles, books, CDs, DVDs, games, and jewelry. • Pick dates & times for your sale. According to Larry, Fridays and Saturdays are the best days and Sundays tend to be a wash. However, he’s been known to get quite a few customers on Thursdays as well. As for times, Larry suggests opening your sale around 8:00 a.m. and closing it no later than 5:00 p.m. Serious garage-salers like to shop early so they can get first dibs on the good stuff (I guess it’s an “early bird catches the worm” kind of thing). Some will even show up the night before to get a sneak peek at your wares, so be prepared! Check out Delightful Order for Garage Sale supplies like this printable sign. Check out Delightful Order on Etsy for some great garage sale supplies. • Advertise. Your best bet is to put up big, legible, two-sided signs (with days and times of your sale, your address and arrows pointing in the right direction) around town and at the end of your street a few days before your sale. Balloons will get their attention too. NOTE: check with your city hall first to make sure there aren’t any restrictions on signs. Other advertising avenues: flyers, the internet and local newspapers. • Decide what you’ll need ahead of time. Some of the essentials: long tables (borrow them if necessary) to display your merchandise, a garment rack or long shower rod to hang clothes, shelves for books & knickknacks, a card table for checking out and chairs to sit on, labels/tags for prices (use big ones for larger items), a cash box (a shoe box or an old metal tin works), tablet & pens to tally/keep track of purchases (a portable calculator may help too if you’re bad at math like I am), bags & boxes for carrying merchandise and newspaper for breakables. Don’t forget the cash! You should have enough small bills and coins to make change. • Price items accordingly. Shoppers are looking for bargains – we’re talking how low-can-you-go deals here – so don’t overprice your merchandise and be prepared to haggle, even if it’s over a measly 50 cents! Use round numbers like .25, .50, .75, $1.00, etc. so it’s easier to make change. On the last day of your sale, mark down whatever’s left by 50% or more to get rid of it. Or, do what Larry does and let people fill a grocery bag for $5.00. Have a free box for items that would go for less than a quarter, like little toys for kids. 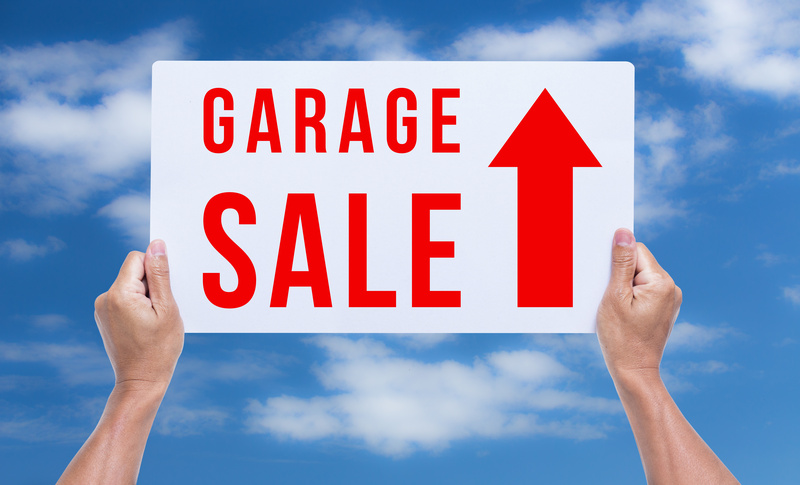 Of course you want to make some money, so click here for guidelines on garage sale pricing. Hint: If more than one person/family is involved use different colored labels or people’s initials to keep track of who’s selling what. • Focus on presentation. Arrange tables so it’s easy for people to navigate between them and set everything up in a neat and orderly fashion, by category. For example, line up books, movies & music by genre, display clothing by gender, size and type, and put similar items next to each other. Place more desirable merchandise, like furniture, sporting goods and small appliances, in a prime spot so people notice them right away when they walk/drive by. • Create an inviting atmosphere. Play music in the background (it doesn’t have to be elevator music, but nothing loud or offensive – after all, children and grandmas come to these sales!). 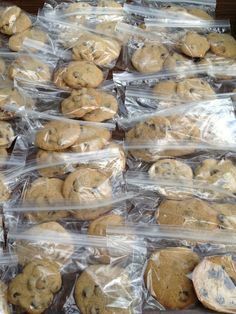 Offer beverages like bottled water and soda, and maybe a few treats like cookies or bars for $1.00. Better yet, have the kids set up a lemonade stand and let them keep the profits. • Make checkouts easy and pleasant. Be courteous with customers and carefully pack their purchases. Always smile and thank them when they leave. Remember, happy customers are loyal customers. 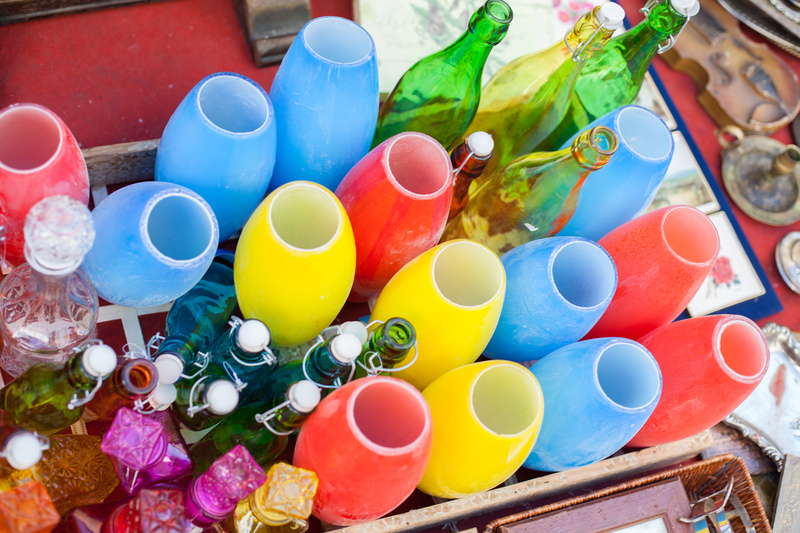 Follow these basic tips and you’ll be a garage sale guru in no time. Catherine B enjoys her work, but is looking forward to retiring so she can write whatever (and whenever) she wants at home in her pajamas.